Time for a fast update on the trip to Kenya. First, the new passport arrived. After jumping through the hoops presented by the powers-that-be, along with sending $52.25 to a service that will retrieve a certified, embossed copy of my birth records, the process was a breeze. I'm still a bit unclear why I needed a certified copy instead of the embossed certificate I had that was given to my mother on my birth, but it's the government. Arguing simply delays the inevitable, which surrender to the bureaucracy. Next came the research phase and that will continue until wheels up, currently scheduled for December 27th. So far this week, I've read Kenya - Culture Smart by Jane Barsby, How To Be A Kenyan by Wahome Mutahi, and Uncertain Safari by Allan Winkler. On the darker side, I've started Histories of the Hanged by David Anderson which details the Mau Mau rebellion. I also got a map of Kenya so I can build up my mental reference points for the places mentioned in the various books. All in all, a good start. Not a history or cultural guide, Determined Runners by Justin Lagat was an interesting read and short enough to complete in one sitting. This was the first book I've read on my new iPad and a part of the test on which computer to take with me. Anyway, I thought the book offered a different and will put up a short review later in the week. Justin is a regular contributor to RunBlogRun. Did you know that Kenya uses 240v, 50 hertz power? Nope, neither did I. Looks like I need to find out where to get a transformer once I get in-country. I've played this game before, in Australia. The plug-ins are different, too, but I can buy adapters for those before I leave. This assumes that I will be in an area with power. 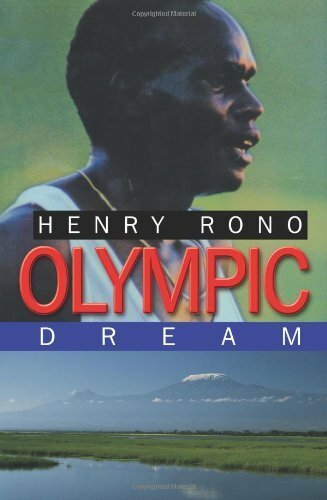 I have an invite to Nandi Hills, home ground for Kip Keino, Henry Rono (one of my favorite runners and author of Olympic Dream), Janeth Jepkosgei (with the totally cool nickname of "Eldoret Express"),and Mike Boit. If I end up in the outerlying villages, which hopefully I will, power and running water may be a bit on the iffy side. I also have checked in with Richard and Andrea Kaitany who run Simbolei Academy. The Academy exists to expand the opportunities for Kenyan girls who live far from the urban centers. Due to the economics of the region - culturally very rich, but cash poor - girls often are not able to attend school past the primary grades. Richard and Andrea recognized a need and sprang into action. Building the Academy takes time, though, and money. Buying seven acres of land from a closed sawmill, they've begun to transform the property into a school. They also have a cottage for rent. No word on openings during my visit, but I'm very hopeful. Found a fun sounding B&B style house for the time I'm in Nairobi. There's a whole slew of vaccinations I need, plus malaria medication. Frances, my doctor, will be thrilled. She'll also question my sanity, but she's been doing that for years anyway, so it's no extra bother. I checked out driving in Kenya, and decided to rely on public transportation. They drive on the wrong side of the road (Yank perspective) and I won't be there long enough to make the adaptation to driving on the left. It should be enough time to reawaken the Australian habits of looking right, left, right before crossing traffic. I'll just have to remember to keep my head on a swivel when I get back, lest I get caught looking the wrong way and step in front of a bus. Not worried about food. If it can't outrun me, it counts. Except for Brussels Sprouts. I have a catch-and-release program for those. I plan on running while I'm in Kenya. Fortunately, I'm pretty sure the Kenyans are much too polite to laugh. Unless they've imbibed Chang'aa - their version on moonshine. The literal name means "kill me quick." Still, I can't go to Kenya and not run. Shoot, I can't go to Indianapolis and not run. Indy is not nearly as exciting. So I'll be running. You know the punch line for the joke about out-running a lion? - "I just need to outrun you!" Know how fast the Kenyans are? Really hoping not to come across hungry lions.